The Toro Rosso driver re-activated torpedo mode when he was involved in a three-way crash alongside both McLaren’s at the start of the Chinese Grand Prix. Kvyat and McLaren’s Lando Norris sandwich the second McLaren of Carlos Sainz at Turn 6, throwing Norris’ car onto two wheels and causing damage to all three – the Virtual Safety Car was needed to clear the debris. However, the Russian was shocked to have been handed a drive-through penalty for his efforts, and will demand answers from the stewards. “Regarding the lap one incident, I’ve seen it many times now and to be honest I totally disagree with the penalty,” he told reporters in Shanghai. Kvyat had appeared to understeer into Sainz, but he argued this was not the case. “Absolutely no understeer, nothing like that, honestly” he explained. “It was a corner exit and my car was already totally straight. The regulations say I have to leave a cars width to the car next to me and it was three cars in one corner with one coming back on track very sharp and another sandwiched behind. “Then I went in the air from the hit from behind and then I went into Norris’ car. “So I will speak with the stewards behind closed doors to try to find a solution. His team-mate Alex Albon had a better race, going from a pit-lane start to claiming a point for Toro Rosso with P10. Kvyat was particularly disappointed because he believed with a clean race, he would have been well within the points-paying positions. 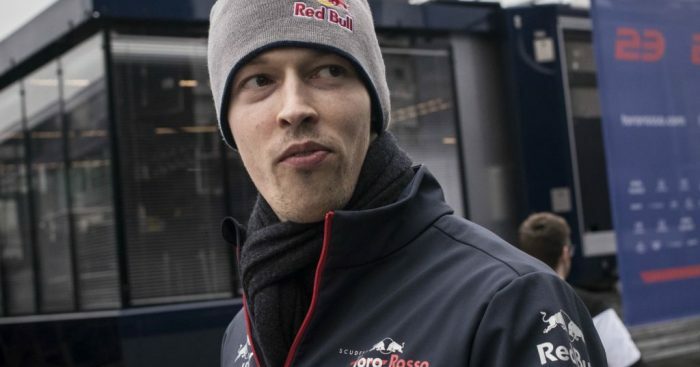 “An unfortunate race with the pace I think we had today,” said Kvyat. “Very unpleasant not to be able to transform the pace into anything in the last two races now. Sainz stressed that he doesn’t “pray for penalties” to be handed out, but believes Kvyat needed to show more patience. “I don’t pray for penalties or ask for penalties. I just ask for a bit more patience in lap one,” he stated. Norris admitted that he hadn’t seen the crash clearly, but since the stewards had deemed Kvyat responsible, then he was angry with him for ruining McLaren’s entire race. “I didn’t see so I can’t say exactly whose fault it was but if the stewards have said that then it’s a shame because he effectively took both of our cars out of contention for getting points – which was possible.